Welcome to Robi 2GB Internet 129 TK With Per day 20 MB Free Facebook Internet Happy New Year 2017 Offer. 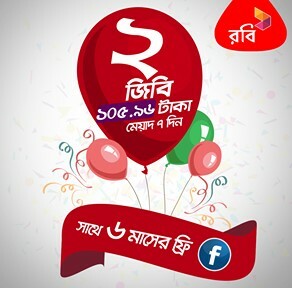 All Robi customers are eligible to buy Robi Delight Internet Offer 2GB 129 TK with 6 Months Free Facebook Browse Happy New Year Offer. If you want to buy this Robi Delight Internet package first, Continue reading the full article to get a clear idea and all information about Robi 2 GB @ 129 TK Delight Internet offer. To activate Robi 2GB@129TK Delight internet Pack just, dial USSD Code *123*02#. Customers can use this Delight internet, both 2G and 2G Network Area and uses time 24 hours in a day. The validity of Robi 2GB Internet offer 7 days. This Delight Robi internet package is Auto Renewed activate pack. When Data usage beyond the packs, data volume from other individual data packs (if any) or BDT 0.02/10KB will be applicable. Thanks for staying with us a long time and visiting Robi 2GB Internet 129 TK Offer article. If you have any question or confusion about Robi Delight Internet offers, Just comment the box. We reply as soon as possible.